The maximum strength non-steroid anti-inflammatory, analgesic and antipyretic. 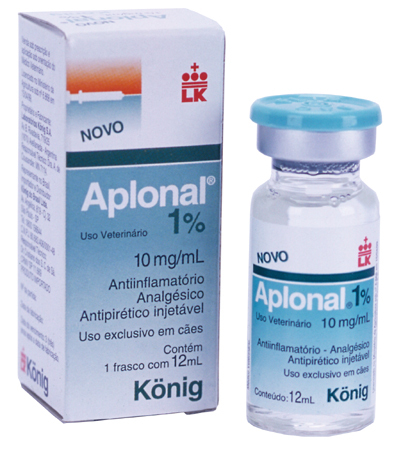 Non-steroidal anti-inflammatory, analgesic and antipyretic injection, for canines/dogs, with a potency equivalent to morphine. Each ml contains 16 mg Flunixin Meglumine (equivalent to 10 mg of Flunixin base) and auxiliary agents q.s. Relief of pain and inflammation in muscle-skeletal disorders (arthrosis, disc diseases, myosistis); acute inflammatory conditions; endotoxic shock, post-traumatic and post-surgical pain; in ophtalmology: surgery, iritis/anterior uveitis, keratitis and conjunctivitis; supporting treatment in parvovirus, in dogs. Apply 1 ml per 10 kg of weight (equivalent to 1 mg of Flunixin per kilo of weight) through IM or IV route, every 24 hours, maximum 3 applications.